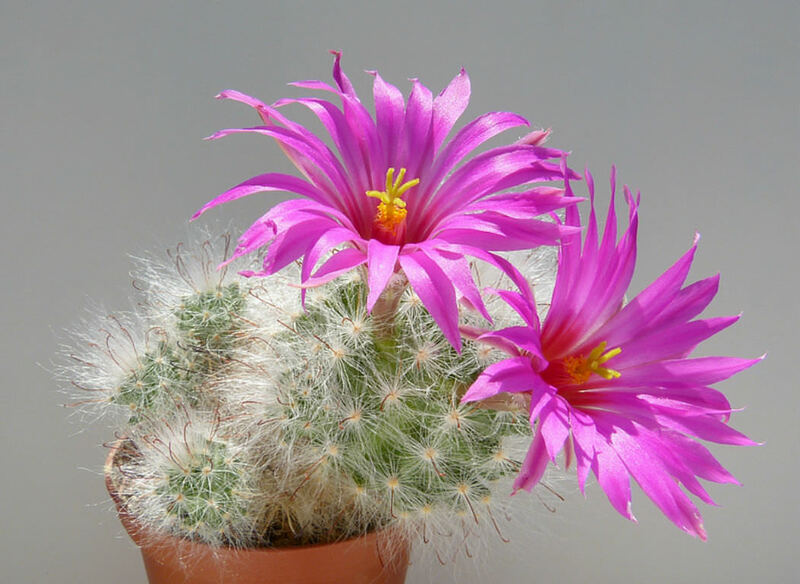 Mammillaria guelzowiana is a cactus that grows fleshy, globose, at first solitary and then forming groups. The stems have a spherical, apically depressed, up to 7 inches (17.7 cm) tall and up to 10 inches (25 cm) in diameter. Tubercules are conical and cylindrical. Mammillaria guelzowiana has 1 – 6 thin central spines, slender, needle-like, reddish brown to yellow, up to 1 inch (2.5 cm) long. The 60 – 80 radial spines are long and twisted, about 0.6 inch (1.5 cm) long. The bell-shaped flowers are bright pink to intense purplish red with light scent, up to 4 inches (10 cm) long and up to 7 inches (17.7 cm) in diameter. The fruits are almost spherical, pale red or yellowish white, about 0.3 inch (8 mm) in length.